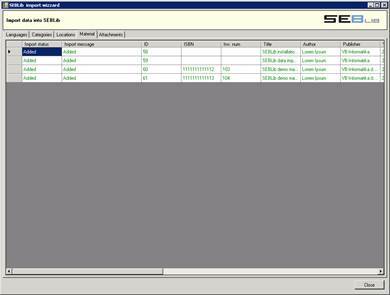 SEBLib import wizard can help you to successfully collect, prepare and import data into your SEBLib digital library. It can be installed on any machine running Microsoft .Net framework 2.0. It is recommended that you install this tool on your client computer and not on the server running SharePoint. 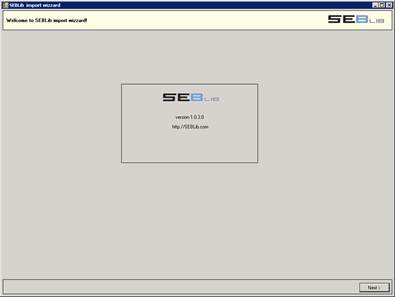 Extract files from SEBLibImportWizard.zip to a local folder and run setup.exe to install wizard on your machine. If you already have a catalogue of material then you can simply export it to a delimited text file, otherwise you can use a predefined Excel template or a barcode scanner to get a list of your material as fast as possible. If your library is smaller or highly distributed among various locations (offices), you may decide that everyone enters their own material directly into SEBLib application. If every colleague has only a few books, this might be the best option, since they will get familiar with SEBLib at the same time. If you have a larger collection on a single place you may choose to use a barcode scanner (or an equivalent phone / tablet software) to scan your material ISBN codes and then import them as delimited text files”. During import you can retrieve additional metadata (title, author, etc.) from external web services. You can also decide to send an email with a predefined SEBLib Excel template so everyone can enter their material in an organized way and return it back to you. When templates are filled, you join all files into a single one and follow instructions for Excel sheet import. Template “SEBLibManualEntryTemplate.xls” is found inside the “SampleData” folder. SEBLib import wizard allows you to import data from “delimited text” and “SEBLib XML” files. In most cases delimited text file will be the best choice, since SEBLib XML is more advanced, complex and takes more time to prepare data. If you have a lot of material you can use barcode scanner (or an equivalent phone / tablet application) to get collection of ISBN numbers and then import those using instructions for delimited text files. Metadata columns like title and author can be retrieved using external services in SEBLib. If you store your book catalogue in an Excel sheet, you can simply save it as a “csv” file and then import it following Delimited text file instructions. 2. Check if the first row contains column names without spaces. If not - add a row with column names. See “SEBLibManualEntryTemplate.xls” for example. Lending Library list can be saved as Excel / CSV file and then imported using instructions for delimited text files. There is also a predefined field mapping file in “SampleData” folder: “LendingLibrary2007_ImportFieldMappings.txt”. Importing text delimited files is very simple. 2. Click button “Next” on the welcome screen to open import settings. 3. In SharePoint Web sections first enter SEBLib web url and select authentication type. 5. Select data file and optionally provide attachments folder if you plan to import cover images from your local system. 6. Verify field mappings to match columns in your data file. If textbox next to field name is empty, that field will not be imported. 7. When all fields contain correct values press button “Next”. Wizard will first load existing categories, locations and languages list from your SEBLib web. Then it will load rows from your data file and parse them according to field mappings. Most of fields will be written to material table. Categories, locations and languages are searched by title and if a match is found, appropriate ID is used. If value is not found then a new row is created in appropriate table. When this step is completed, you can manually check and correct values. No data has been sent to the server so far. Unchanged servers values are colored black, new values that will be written to server are colored green. 8. Check and edit loaded data. When you are ready press button “Next”. This page will help you to import metadata from external services. 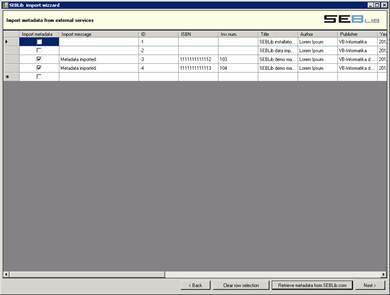 Before you continue make sure you have a valid license installed in your SEBLib web (check Library settings page) and you entered a metadata provider in your SEBLib.com account. 9. Check “Import metadata” column for each row you want to refresh with external data. You can also click “Select all rows” and “Clear row selection” button to select/deselect all rows. When ready click button “Retrieve metadata from SEBLib.com”. A progress bar will appear and when finished you will get a popup message. Click Next to move to the next step. 10. At this point data is ready and you can make a final check. Press ”Import data into SEBLib” button to start import. A progress bar will show you current status and when done you will see a popup message. 11. Check import status and messages for imported rows. You can close import wizard and continue editing data in your SharePoint SEBLib site. Preparing data in SEBLib xml format requires programming skills and understanding of XML schemas. Please contact our support team for additional instructions. We are using cookies to give you the best user experience on our site. Cookies are files stored in your browser and are used by most websites to help personalise your web experience. To enable all features on this site including online support and display of embeded videos, please accept cookies. Find more about cookies on cookie usage page.